Whether you need a large bowl for mixing ingredients or a small one for dip, you will have everything you need! 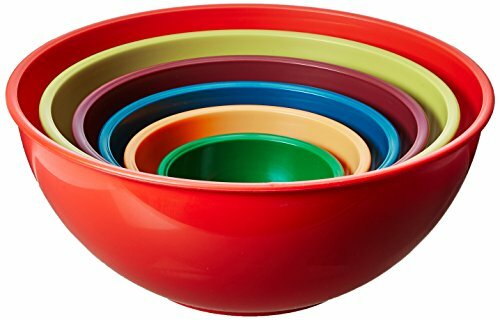 This 6-Piece Polypropylene Mixing Bowl Set is a perfect fit for your kitchen needs. Made of durable heavy weight plastic, Which makes them dishwasher, microwave, and freezer safe. The bowls come in varying sizes ranging from 0.32 qtr. to 5.8 qt., Which makes them useful for any task in the kitchen or your camping trip. Anyone who loves baking will find an instant use for these food prep bowls. Each set of these bowls comes in assorted beautiful bold colors. They are very convenient to store as well, Designed to simply nest together for easy storage in any cabinet. You can also use these as serving bowls and make a statement. If you have any questions about this product by Home Gourmet, contact us by completing and submitting the form below. If you are looking for a specif part number, please include it with your message.